This tea has me a bit confused. I initially purchased it because it was one of the new straight teas at DavidsTea and the salesperson at my local DavidsTea waxed poetic about it. When I bought it back in April, it was categorized as a white tea. At the time of writing this, it’s categorized as a pu-erh tea on the DavidsTea website. To be fair, the description of the tea has it as a “white pu’erh tea”. The combination of the two has me intrigued, and I nearly forgot that I had even bought this tea because it fell between a couple bags. (No jokes about how I have too much tea, please!) 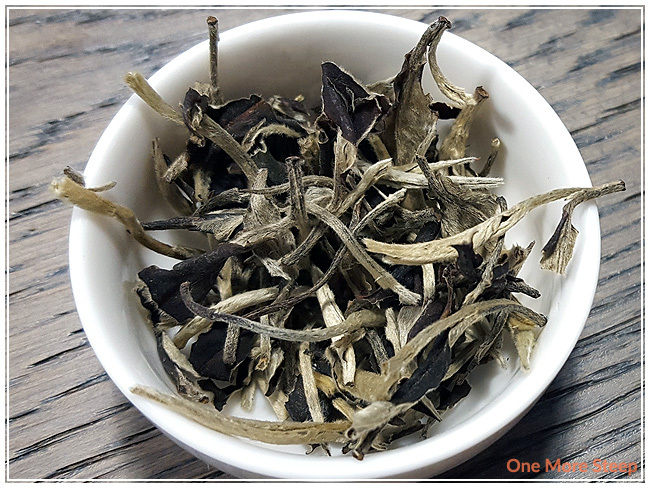 But for the tea enthusiasts out there, Yue Guang Bai is another name for Moonlight White (and another literal tea name translation) in case you wanted to source out other Moonlight White teas. Moonlight White is actually a really beautiful dry leaf. There’s the white, feathery down on the leaves, and then there’s the darker part of the leaf that provides such a stark contrast. It is a fairly airy tea, so you wind up with a fairly bulky bag because the tea leaves take up so much room. The dry leaf has what I would describe as a honeyed smell, it smells light and sweet to me. 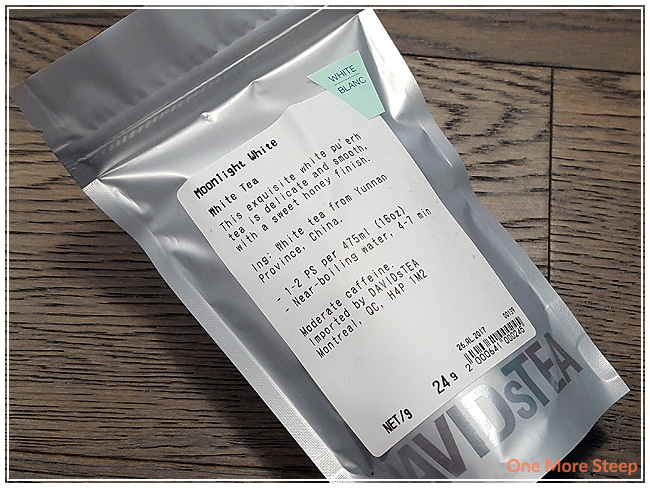 DavidsTea recommends steeping Moonlight White in near-boiling water for 4-7 minutes. The temperature range for this tea (as per their website) is 194-203°F (90-95°C). As my Breville IQ Kettle has a white tea setting (185°F/85°C), I opted to use that as I didn’t want to burn the leaves. My initial steep was for 4 minutes. Moonlight White steeps to a pale yellow initially. It has a lovely honeyed smell to it, it smells sweet to me with a touch of vegetation. There’s an overall smoothness to this tea, no bitterness or astringency to note. I found it had a pleasant mouthfeel and it goes down easy. My water that I use is fairly tasteless, I live in an area with soft water. I found that this tea had a bit of a mineral water flavour to it, which was surprising (given that I live in an area with soft water…). It isn’t off-putting, it was just surprising. I greatly enjoyed the honeyed taste to this white/pu-erh tea, and I don’t think it needs additional sweetener as it’s sweet enough. As Moonlight White is a straight tea, I was eager to steep the leaves a few times. I ended up steeping the same leaves for seven times. I found that the tea leaves held up well. The colour of the liquor became a deeper and deeper golden yellow as I went through the steeps (becoming the darkest for resteep 3). 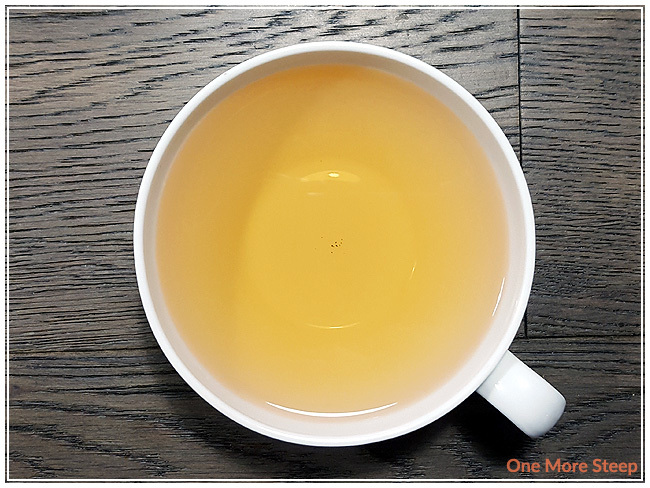 The flavour of this tea didn’t really change, although the honey and mineral notes did become stronger, but remained at the same flavour balance as the initial steep. 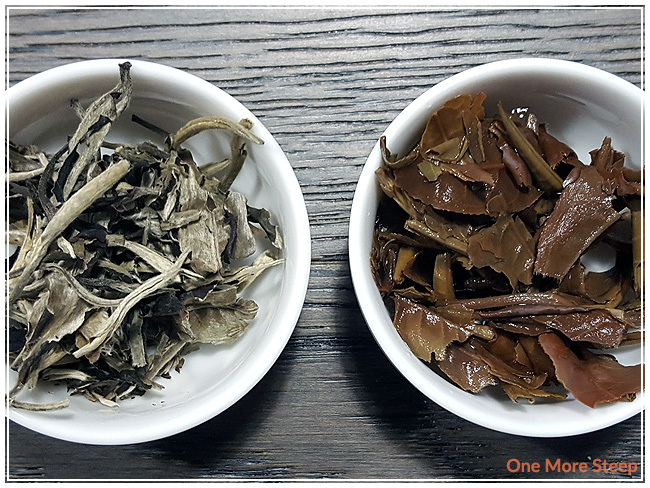 I found that the leaves did really well, and it took to the seventh overall steep to really find the flavour lacking. 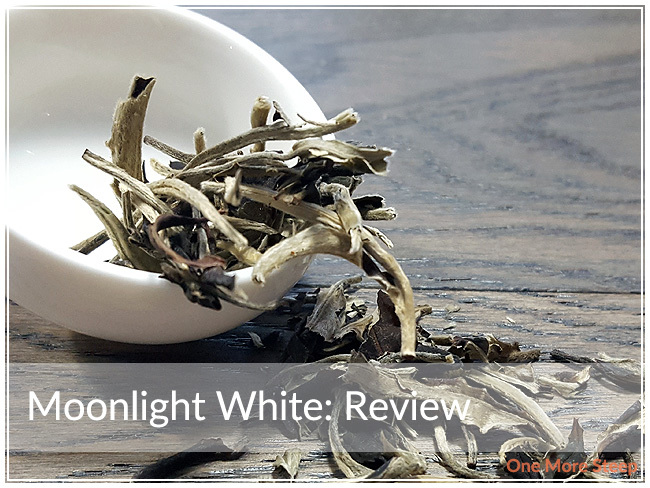 I loved DavidsTea’s Moonlight White. This tea is a curious combination for me – white and pu-erh. I found that the tea tasted great and the leaves held up incredibly well to resteeping. I think that tea is delicious and would probably pair well with some sweets or desserts. The one thing that I’m not completely in love with is the price tag. $25 for 50g is fairly steep and it makes me hesitant to really want to fall head-over-heels in love with this tea (because I just know that I’ll want a tin… or two). Overall, I think the tea is great and if you can afford this tasty tea, I would definitely recommend it. The nice thing is that the tea is of a good quality so it can be resteeped (better value! ), and you don’t need a lot of the tea to steep a teapot (and then steep it again and again), so a little bit of this tea goes a long way. It’s definitely something that I really love, but don’t want to get into the habit of keeping in my tea stash because of the price. Hopefully there are cheaper Moonlight White alternatives out there, or else I’ll be getting into some trouble soon! Quick question: how long were each of the following steeping times? I added an extra 30 seconds for each steep (initial: 4mins, then 4m30, 5m, 5m30, etc. ).